Among the usual ads for cars, beer, fast food, and insurance that will air during the 2016 Super Bowl will be an unlikely one–an ad from a business so small that you’ll wonder how it paid. Answer: it won the QuickBooks Small Business Big Game contest for an expenses-paid, 30-second commercial during Super Bowl 50. By virtue of having generated tens of thousands of votes and rallying support from their local and social media communities Vidler’s 5 & 10, Death Wish Coffee Company, and Chubbies Shorts are the Intuit contest’s three finalists. 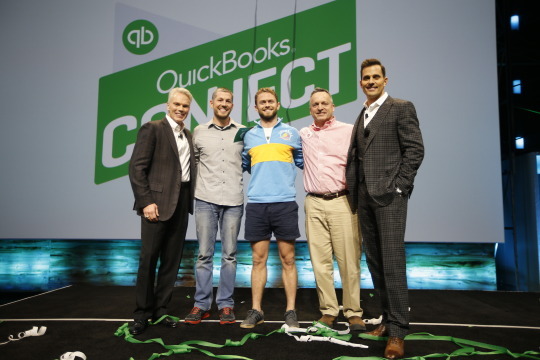 For the winner, “life is going to change when that football game airs,” says competition host and past Apprentice reality show winner Bill Rancic, (pictured above at far right, with Intuit CEO Brad Smith at far left). The businesses are so small, in fact, that meeting demand created for their products when 100 million-plus viewers see their ad will be a challenge. Chubbies employs 35 people full-time in its San Francisco ‘80s-style men’s shorts company. Vidler’s 16,000-square-foot store in East Aurora, NY, might be one of the largest five-and-dime stores on Earth, but still it has only 20 full-time employees. And though the “world’s strongest coffee” from Death Wish of Round Lake, NY, is available on Amazon, only 8 people work there. When GoldieBlox won the same Intuit competition for a 2014 Super Bowl spot, it contracted with a second production factory in China to brace for the attention its $4 million ad would generate. Don Vidler, the third-generation operator of his family’s 85-year-old store, (pictured second from right) says Vidler’s has operated an e-commerce site for several years, but not seen much activity online. “We’ve been talking to our website people to make sure our server could handle the traffic and inquiries if we got the commercial,“ he says. Chubbies founder Tom Montgomery (pictured in shorts) was able to afford to start his apparel company by finding a manufacturing partner who was willing to make only 25 pairs of shorts at a time. His first batch sold out on Lake Tahoe’s beach in a weekend. Now he’s looking to his supply chain to determine how to make and ship thousands of pairs of shorts, should his business win the Intuit contest. Though the grand prize winner won’t be announced until January, an ad agency is already at work on the campaign. The two runners-up will each receive $25,000, as well as local media and advertising valued at up to $15,000. And the winner’s “big budget, high-value commercial” that will air February 7 “will fit right in with the beer and automotive ads,” Rancic says.